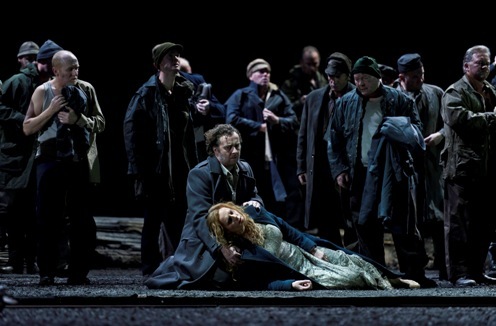 Wagner's Tannhäuser, not seen at Covent Garden for some twenty-five years, makes a most welcome return to the Royal Opera with this new staging by Tim Albery. Its absence is perhaps understandable since, despite the enormous popularity of certain numbers (the overture, Wolfram's 'Abendstern' aria and Elisabeth's Prayer), it remains the most problematic of Wagner's canonical operas. Existing in several textual guises, it is most often performed in the awkward hybrid that is the Vienna Version, where post-Tristan additions made for Paris in the 1860s (primarily the lengthy Venusberg ballet) are grafted onto the original version composed for Dresden in the 1840s—often glaringly pre-Tristan, and pre-everything else, in some of its rather clunky dramaturgy. Until the end of his life, as Mark Berry notes in his programme essay, Wagner said he 'still owe[d] the world a Tannhäuser'. While it is now standard to perform the Vienna version, as is the case here, the work still presents a unique challenge to the director. Should one strive for concrete sense of place in contrasting the Venusberg and the Wartburg? Should one aim for abstraction or try and make literal sense of the thing? Albery seemed to have plumped for a no man's land in between, and the result makes for a fair amount of head-scratching. His main aim, it seems, is to emphasise the opera as meta-theatrical. For the Venusberg, then, an exact copy of the Royal Opera's proscenium and curtain was set back from the front of the set. It framed the ballet, which was imaginatively choreographed by Jasmin Vardimon but, performed by non-descript twenty-somethings in evening dress, struck me as a coldly unerotic and unconnected to anything else we saw all evening. Having established the whole first scene as performance within performance, the disintegration of the Venusberg, so vividly portrayed in Wagner's score, left us with hardly anything. The proscenium was whisked upwards, while Venus and her bed sank into the stage (not far enough, incidentally, since from the balcony she could be seen skulking off into the wings) to be replaced by a mound of grass from which an audibly nervous shepherd boy sang beside a tree. Once he'd sunk back down, however, we were left with nothing; in fact, from any seat above the stalls, we were left with a yawning chasm stretching across the stage for much of the time. It was a somewhat dispiriting sight. The sets for the subsequent two acts portrayed the proscenium arch in various states of decay: a tumbled down ruin in the second, eroded almost beyond recognition in the third. It wasn't entirely clear, however, how this conceit related to the rest of the opera's action. Did it represent theatricality as a morally treacherous extension of Venus's sordid charms, now banished for good? Should this part of the set even be viewed as a physical reality, or did it exist purely in the realm of meta-theatrics? Further complications came in the Wartburg scene with Albery indulging his penchant for the Eastern-bloc destitution chic familiar from his Royal Opera Dutchman. This scenic shorthand for gritty realism is a currency that's long been devalued, and surely cannot, as here, be employed without acknowledgement of the political implications it carries with it (further emphasised in this case by a perfunctory sprinkling of AK-47s). Although Wolfram's song worked in this context as an expression of utopian longing, the rest of the song contest, and the crowd's chaste disgust at Tannhäuser's debauchery, took on a faintly comic sense of incongruity. The production, however, achieved an impressive, austere beauty in Act Three, where David Finn's lighting captured the desolate mood beautifully, while a dead tree lies folornly on one side as an emblem of decay. In the final redemptive chorus the shepherd boy removes the dead tree and brings in a fresh sapling, plants it and pulls up a chair to watch it grow as the curtain falls. This makes sense on one level, but ultimately rings hollow in a production that has done nothing to make us believe in this world or the all-important belief structures of its inhabitants. Dramatically, then, this redemption counts for little. Thankfully, musically it counts for a great deal more. For throughout the evening a sturdy foundation of the highest musical values was provided by Semyon Bychkov, who proved once again that, in the right hands, the Orchestra of the Royal Opera House can give any of the world's great bands a run for their money. A very leisurely account of the overture's opening bars might have made one fear we were in for a long evening, but Bychkov went on to strike a well-nigh perfect balance between long paragraph and passing detail. The rich brass and silky strings, meanwhile, were a great deal more seductive than anything the Venusberg had to offer, and the expanded chorus were outstanding. It's easy to take the vocal stamina and security of Johan Botha for granted. Here he was tireless in meeting the demands of the role, producing a tone that was always powerful, with occasional glimpses of something more burnished and beautiful. Dramatically, however, he remains somewhat inert. There was little sense of either him (or Michaela Schuster's powerful but unseductive Venus) being anything but spectators in the Venusberg; the opera's central conflict, therefore, was only partially established. Eva-Maria Westbroek, by contrast, brought a vibrancy and dramatic edge to her Elisabeth that made her more than a mere embodiment of virtue. Christof Fischesser made a robust Landgraf, while a series of Royal Opera regulars filled the smaller roles effectively. The musical revelation of the evening, however, came in the Royal Opera debut of Christian Gerhaher. 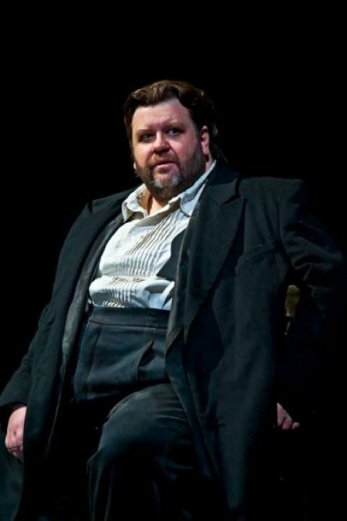 His reputation as a lieder singer is well established, but few could have anticipated how, by some astonishing act of vocal alchemy, he'd seem to turn the Royal Opera's auditorium into the Wigmore Hall, grand opera into intimate liederabend. His voice—a sort of gently flickering silk—filled the space without the slightest sign of strain or pressure, and every crystalline syllable came across with the legato line nobly unruffled. His 'Holde Abendstern' was hypnotic, but his greatest achievement, perhaps, was in so effectively setting the scene of melancholy contemplation earlier in Act Three. Either way, the first half-hour of that act was an undoubted highlight and worth the admission by itself.